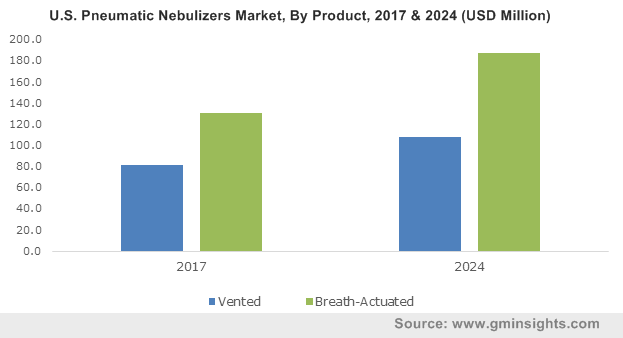 Pneumatic Nebulizers Market size was valued at USD 610.1million in 2017 and is expected to witness growth of over 5.3% CAGR from 2018 to 2024. Growing incidences of respiratory diseases such as cystic fibrosis, asthma and chronic obstructive pulmonary disease (COPD) will act as primary driving factor for pneumatic nebulizers during the forecast period. Respiratory diseases possess enormous health burden globally. Nearly 200 million people suffer from COPD and around 235 million people suffer from asthma worldwide. Surging geriatric population base, susceptible to suffer from various chronic conditions and increasing demand for non-invasive techniques of drug delivery will stimulate industry growth. According to U.S. Census Bureau, there will be around 78 million people aged more than 65 years, while 76.7 million under 18 years of age by 2035 in the U.S. Probability of suffering from respiratory illness such as chronic bronchitis increases with age. As per the U.S. NIH 2016 data, around 10 million people in the U.S. suffer from chronic bronchitis, majority of which are aged between 44-65 years, while 24.3% people are older than 65 years. Pneumatic nebulizers are easy operative in nature as well as cost-effective as compared to other nebulizers. Moreover, they are suitable to majority of medication category resulting in high adoption rate. Technological advancements enabling portability, smaller size of device and mobility due to rechargeable batteries should positively impact industry growth. However, lack of awareness regarding respiratory diseases and its treatment will restrain industry growth to certain extent during the analysis period. Breath-actuated product segment accounted USD 366.3 million in 2017. Higher medicine delivery, reduced drug loss and aerosol production offered by this type of nebulizer will drive segmental growth during the forecast timeframe. Breath-actuated nebulizer (BAN) AeroEclipse, offers delivery efficiency as well as improved control of dosing should positively impact industry growth. Vented pneumatic nebulizers segment will witness 4.8% CAGR during the forecast timeframe. Affordable cost coupled with easy integration of this type of nebulizer has escalated its demand in developing countries such as India and China. Industry players are focusing on developing innovative products to consolidate their market position. In April 2017, Ventec Life Systems received U.S. FDA approval for VOCSN, portable life support system that delivers five respiratory therapies including nebulization, cough, oxygen, suction, and ventilation. 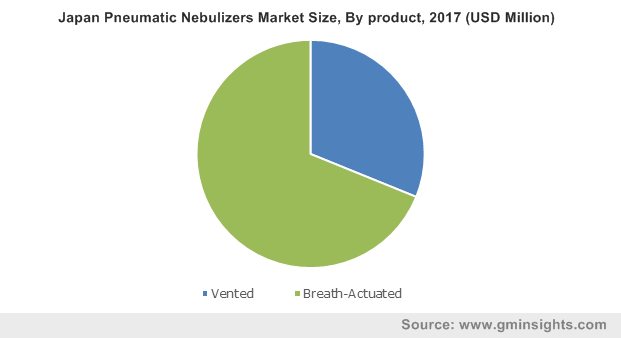 U.S. pneumatic nebulizers market dominated North America pneumatic nebulizers market with over 90% market share in 2017. High incidence of respiratory diseases, technological advancements and several government initiatives to reduce disease burden will drive U.S. market. COPD is third leading cause of mortality in U.S. as per American Lung Association data. Growth of home healthcare sector in the country will positively impact business growth. 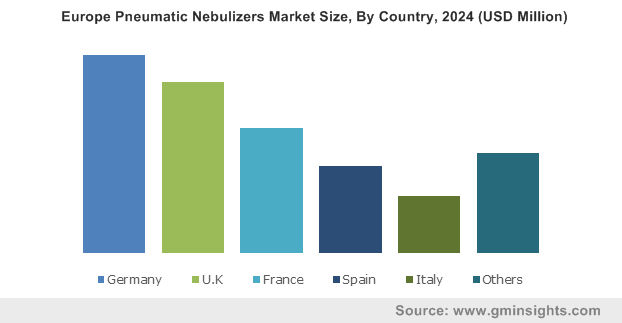 China pneumatic nebulizers market accounted USD 34.9 million in 2017. Increasing number of baby boomers and growing burden of respiratory diseases due to increased tobacco smoking and elevated air pollution level will drive Chinese market. Numerous initiatives undertaken by Chinese government along with companies such as Johnson & Johnson to reduce respiratory diseases burden in the country should positively impact market size growth. In June 2018, Johnson & Johnson Innovation, division of Johnson & Johnson (China) Investment Ltd. launched Shanghai Lung Cancer Innovation QuickFire Challenge in the country, to promote lung health and identify new solutions for reducing diseases such as lung cancer in the country. 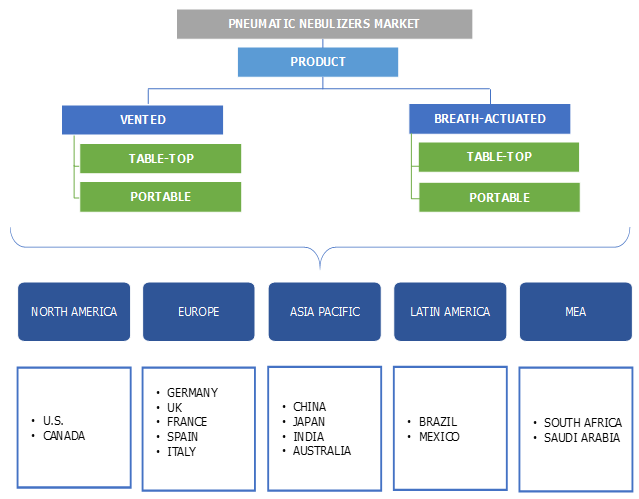 Few of notable industry players operating in global pneumatic nebulizers industry are Philips Respironics, Heyer Medial AG, Briggs Healthcare, Omron Corporation, Salter Labs, Becton, Dickinson and Company, PARI Medical and DeVilbiss Healthcare. Industry players are adopting various strategies such as acquisition, strategic collaboration and partnership to strengthen its market position as well as accelerate development of innovative nebulizers to fulfil increasing demand for cost-effective advanced products. Shift in trend from invasive to non-invasive drug delivery methods coupled with growing demand for cost effective treatment has augmented demand for pneumatic nebulizers. Intense competition prevails in the industry as companies are offering several different types of pneumatic nebulizers. There has been growing adoption of various strategies such as online marketing of products by vendors to expand company’s consumer base. Moreover, growth of home-healthcare sector and user-friendly nature of pneumatic nebulizer has escalated its adoption rate. Industry players are currently focusing on increasing their market presence in developing countries of Asia Pacific region that possess potential growth opportunities for market growth in upcoming years.